Disclosure: I have been selected by Tap Influence to be a spokesperson for Marie Callender's. While I have been compensated for my time, my opinions are my own. My brother was in the Marines since college. It was so stressful for my mother and I when he would go off to war. We would send care packages to him in hopes that he would have a piece of "home" with him during that time. While he is safely back home now, there are still many loved ones protecting us in service. 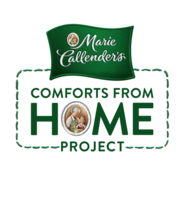 Marie Callender's is launching the Comforts from Home Project by bringing the comforts of home to those who protect America's homes every day: the brave men and women of the U.S. military. Marie Callender's creates homemade meals and desserts that are delectable and really do give that feeling of home. Our family enjoys dining there because of the generous portions and savory selections. The pies are also to die for. Sometimes we will just pick up a pie (or two) to enjoy on a daily basis. It is our go to place for after school performances to "treat" Kenzie. You can really sense the family atmosphere at Marie Callender's. The USO and an army of experts from food, home and travel will provide the comforts of home as only Marie Callender's can - in a heartwarming homecoming. One special soldier will be welcomed back to their family in this national television event on Veteran's Day. This one-hour special will air across a range of my favorite networks including HGTV, Food Network, Cooking Channel, Travel Channel, DIY Channel and Great American County. Make sure to tune in for the "A Hero's Welcome" TV special on November 11, 2014. Connect with Marie Callender's on Facebook.